Adina Apartment Hotel is located in central Brisbane, just a few minutes to Queen St Mall shopping, Southbank Parklands and the Entertainment Centre. Offering guests a choice of well appointed Studios and 1 and 2 bedroom apartments, it is no wonder this Brisbane hotel is the ideal location to stay when looking for Brisbane holiday accommodation. 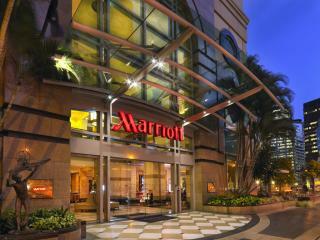 Located in the corporate and financial heart of the city, the Brisbane Marriott Hotel is the gateway to central Brisbane. Al fresco restaurants, riverside markets, sidewalk cafes and the nightlife of this cosmopolitan city are just steps away. Brisbane Marriott Hotel offers guest accommodations with superb city or river views and the Southbank Convention and Exhibition Centres are a short river ferry away from the hotel. If you are looking for excellent Brisbane accommodation then look no further! Four Points by Sheraton Brisbane is a modern and comfortable hotel that boasts a great location with attractions, entertainment and night life that can all be easily reached by foot. The 246 rooms are perfect for your next business trip or holiday to the river city. Facilities at Four Points by Sheraton Brisbane include a business centre, fitness centre, restaurant, bar, cafe, wireless Internet and much more. 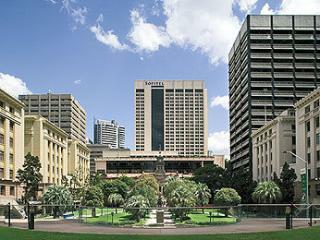 For a relaxed and memorable stay in Brisbane why not stay at Four Points by Sheraton Brisbane? The Hilton Brisbane Hotel is located in central Brisbane, 20 minutes drive from the airport and a short walk from Brisbane's Central Station, the Treasury Casino and Southbank Parklands. Great value five star Brisbane holiday accommodation in the centre of town. 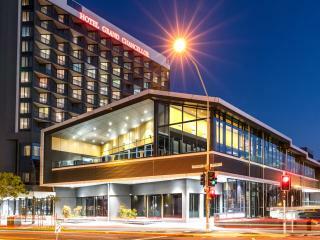 Hotel Grand Chancellor Brisbane has a central location at Spring Hill, located at the highest point closest to the CBD the Hotel offers wonderful views of the city, surrounding suburbs and Roma Street Parklands. Suncorp Stadium is just 15 minute's walk from this Brisbane accommodation, making it perfect for those visiting Brisbane for events. Rooms at Hotel Grand Chancellor Brisbane feature balconies to make the most of the views. Ibis Brisbane is conveniently located in the city centre, within easy walking distance to the Queen Street Mall shopping precinct, Treasury Casino, South Bank Parklands and Brisbane Convention and Exhibition Centre. Budget Brisbane hotel accommodation in a great location. 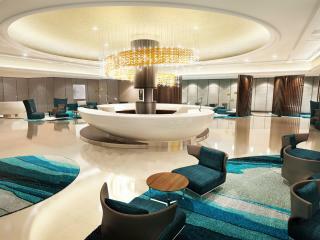 Mantra on Queen is a 30 storey tower offering spacious apartment style Brisbane holiday accommodation. The apartments are located near the heart of the Brisbane city's bustling entertainment, business and Valley precincts. Mantra on Queen is ideal for business travellers, holiday makers and long term stays. Mantra on Queen is a 5 minute walk to Brisbane's CBD and a 20 minute drive from the airport. 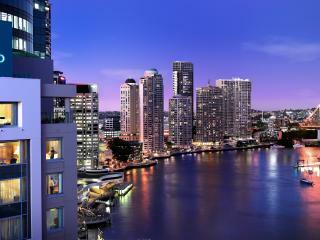 Mercure Brisbane is in the heart of the city, with spectacular views of the river and Southbank Parklands. This Brisbane hotel features 194 rooms, with some offering views over the river. Convenient Brisbane holiday accommodation with Brisbane River views. This Brisbane accommodation offers spacious and comfortable guestrooms with views across Brisbane's Central Business District, the inner suburbs and the hotel central courtyard. Mercure Brisbane King George Square features a full range of hotel facilities including an outdoor swimming pool, sauna, gym, business centre, restaurant & bar plus much more. Enjoy the comfort and hospitality of Novotel Brisbane - a contemporary Brisbane hotel located in the heart of the CBD, one of Brisbane's most popular and stylish properties featuring 296 well appointed rooms and spacious suites, many complemented by superb views over the city. It's just a stroll from boutique city shopping including Queensland 's most up-market shopping centre Queens Plaza, weekend Riverside and Southbank Markets, city cat ferry terminals. Oaks 212 Margaret is ideally located a block from the Botanical Gardens, just a few minutes walk to Brisbane's central business district and shopping precinct. Fully self contained, air conditioned apartments cater for all Brisbane holiday and business needs, as do the facilities including swimming pool, gymnasium, on-site restaurant and full business services. Oaks Aurora offers modern apartments right in the centre of Brisbane. The apartments offer full kitchen and laundry facilities plus large balconies, perfect for entertaining on. This Brisbane accommodation is close to shops, cafe's restaurants, bars, night life, entertainment and parklands. The apartments are ideal for couples, families and those travelling to Brisbane for business. Oaks Casino Towers is ideal for those after Brisbane CBD accommodation which is close to the Queen Street Mall, South Bank, restaurants, bars, cafes and shops. These well appointed self contained apartments are located opposite the Brisbane Treasury Casino and features views of the city and Brisbane River. Oaks Charlotte Towers is an apartment hotel featuring 1 and 2 bedroom self contained apartments, with views of Brisbane's lush parklands, meandering river and changing cityscape. Located on Charlotte Street right in the heart of the CBD, everything is at your fingertips. From cafes and restaurants to shopping in the Queen Street Mall, Oaks Charlotte Towers has the best location in the city. Oaks Festival Towers is an apartment hotel offering guests a choice of self contained 1 and 2 bedroom apartments on 41 levels right in the heart of Brisbane CBD. On your doorstep is a range of cafes and a short stroll away is the Queen Street Mall, entertainment and parklands. Conveniently located in the heart of Brisbane City, the Oaks Lexicon Apartment Hotel offers guests a choice of 1 & 2 bedroom self contained apartments. The apartments are fully self contained with spacious balconies that over look the city. This Brisbane accommoation is just a few minutes from walk from the Queen Street Mall with its many restaurants, shops, cafes and bars. Oaks on Felix is in the perfect position to enjoy all Brisbane has to offer. Oaks on Felix features stunning floor to ceiling glass windows, providing spectacular views of the Story Bridge, city skyline, Brisbane River, Botanic Gardens, and Kangaroo Point. Just a minute away are some of Brisbane's finest restaurants and late night bars on Eagle Street Pier and the Sunday Riverside markets on the river promenade. This Brisbane accommodation boasts an ideal location in Brisbane's CBD, the hotel offers stunning views of the city and Brisbane River. The studio's and apartments are perfect for a business trip or holiday to Brisbane. Park Regis North Quay offers an outdoor swimming pool with sundeck, restaurant and bar, plus much more. The Pullman Brisbane King George Square offers the perfect location in the centre of Brisbane's CBD, within walking distance of the financial district and the Brisbane Convention and Exhibition Centre. The hotel offers spacious and elegant guestrooms with views across the CBD, Brisbane's inner suburbs or overlooking the central courtyard. This Brisbane accommodation is ideal for business travellers plus those staying in Brisbane for a weekend getaway. Perfectly located in the heart of the city, facing the Brisbane Botanic Gardens, Royal on the Park is just a short walk from Queen Street Shopping Mall and the CBD. With its magnificent views of the Gardens and relaxing atmosphere, you'll feel like you're miles away from the bustle of the city! Elegant, contemporary and personalized service make this Brisbane hotel legendary. Sofitel Brisbane Central is within easy walking distance of the city centre, Eagle Street Pier, South Bank Parklands and the Convention Centre. The hotel also has direct access to Central Station, providing convenient transport to the airport and Gold Coast. Features include 413 elegant rooms, a fitness centre, rooftop heated pool and spa, restaurants, boutiques, bars and a nightclub. Perfectly located on the river and alongside the Botanic Gardens, the Stamford Plaza is Brisbane's finest hotel. Style, elegance, charm and the tranquil setting truly indulges the senses. Enjoy European style decor and exceptional service just minutes from the city centre for shopping, markets, theatre and nightlife. This Brisbane accommodation offers a central location in the heart of the CBD. The Sebel Brisbane offers personal, friendly service and spacious suites just minutes from the main shopping precinct, business and financial districts. The hotel boasts a range of studio rooms plus 1 & 2 bedroom suites which are ideal for extended stays in Brisbane as they are fully self-contained. This Brisbane accommodation has everything you want in luxury and more! The Sebel Quay West Brisbane is one of the most luxurious five star all-apartment hotel offering a combination of personal, friendly service and the freedom of your own beautifully appointed one or two bedroom suite. The Sebel Quay West also features a fantastic location opposite the City Botanic Gardens. The Summit Apartments is perfectly located for business and pleasure in historic Spring Hill's charming tree lined streets. The studios and apartment are ideal for both short and long stays. Friendly service and convenient facilities will exceed your expectations at this Brisbane accommodation. Treasury Brisbane is located in two of Australia's finest heritage buildings. This Brisbane hotel is just a minute's walk from Australia's great inner city Botanic Gardens, historic walks and bike ways, department stores, specialty shops and cinemas. This truly is one of the most historic Brisbane hotels. Urban Brisbane is located opposite the Roma Street Parklands, offering a pleasant and quiet environment with spectacular city views. At the same time, the hotel is within a short stroll to downtown business, shopping, dining and entertainment districts of Brisbane City, which offers its guests the convenience to the amenities the city of Brisbane has to offer. iStay River City is perfect for those after modern apartment style accommodation close to Brisbane's CBD. This Brisbane accommodation offers views of the Brisbane River, the city and the Botanical Gardens. The 1 and 2 Bedroom apartments are ideal for business travellers, couples or families who wish to self cater. If you are after accommodation in Brisbane for a weekend, event or business trip why not try iStay River City.